The conserved Lipoprotein-17 domain of membrane-associated protein Q9PRA0_UREPA from Ureaplasma parvum was selected for structure determination by the Northeast Structural Genomics Consortium, as part of the Protein Structure Initiative’s program on structure–function analysis of protein domains from large domain sequence families lacking structural representatives. The 100-residue Lipoprotein-17 domain is a “domain of unknown function” (DUF) that is a member of Pfam protein family PF04200, a large domain family for which no members have characterized biochemical functions. The three-dimensional structure of the Lipoprotein-17 domain of protein Q9PRA0_UREPA was determined by both solution NMR and by X-ray crystallography at 2.5 Å. The two structures are in good agreement with each other. The domain structure features three α-helices, α1 through α3, and five β-strands. Strands β1/β2, β3/β4, β4/β5 are anti-parallel to each other. Strands β1and β2 are orthogonal to strands β3, β4, β5, while helix α3 is formed between the strands β3 and β4. One-turn helix α2 is formed between the strands β1 and β2, while helix α1 occurs in the N-terminal polypeptide segment. 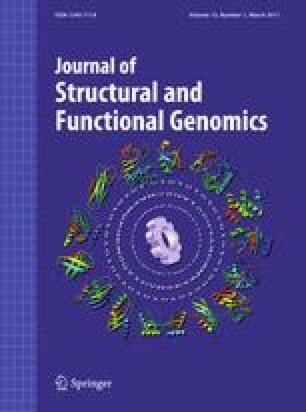 Searches of the Protein Data Bank do not identify any other protein with significant structural similarity to Lipoprotein-17 domain of Q9PRA0_UREPA, indicating that it is a novel protein fold. The online version of this article (doi: 10.1007/s10969-010-9099-2) contains supplementary material, which is available to authorized users. We thank Prof. M. Inouye for advice regarding the biology and biochemistry of bacterial lipoproteins. This work was supported by a grant from the Protein Structure Initiative of National Institute of General Medical Sciences, U54-GM074958. NMR (2KRT) and X-ray structures [3JVC (2.7 Å resolution); 3K63 (2.5 Å resolution)] of the Lipoprotein-17 domain have been submitted to the Protein Data Bank. Chemical shifts, NMR constraints, NOESY FID data, and NOESY peak list data have been deposited in the BioMagResDatabase (16648). Expression plasmids for Lipoprotein-17 domain of Q9PRA0_UREPA are available from the PSI Materials Repository (http://psimr.asu.edu/).